Date: Wednesday 24th June,2015 Time:7:30pm Venue: Alliance Française Accra. Creative artist, Akweley Bernice Animle presents “Laimomo”, a special performance featuring many aspects of the creative arts: drama, dance, music, poetry, painting and photography. 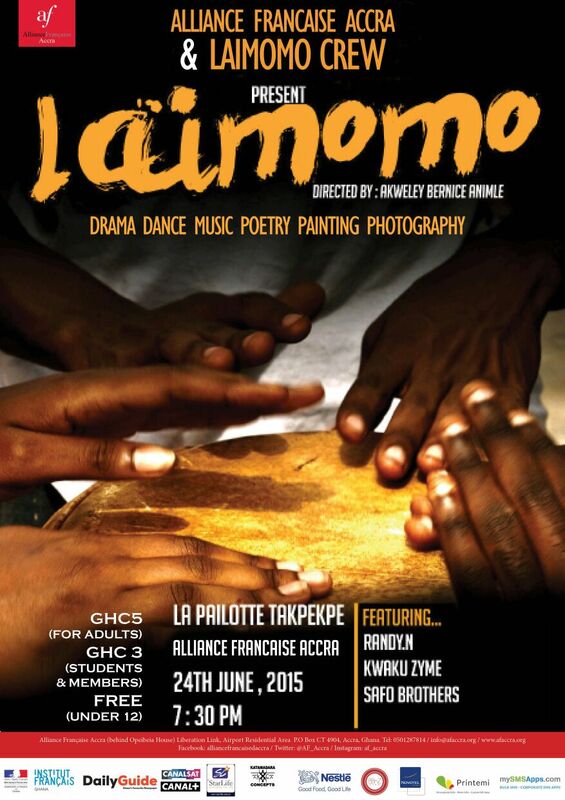 This show will take place on Wednesday 24th June 2015 as part of La Paillote Takpekpe events organized by Alliance Francaise Accra to encourage and support the creative arts. Laimomo seeks to criticize the then and now, taking into consideration sanitation issues and the fact that many have become insensitive to the environment. The show aims to use drama, dance, music, poetry, painting, photography and rap to inspire the audience to stand up against all wrong doings; such as selling in the midst of filth and extortion of tenants by landlords. It seeks to encourage people to go back to communal living where being each other’s keeper was appreciated and emphasize the importance of team work. The central focus of the performance is to question the ever changing state of culture. The Audience is sure to experience a painting brought to life by very talented actors. Akweley Bernice Animle Popularly known as Nana Akweley Bernice 1st loves to talk, watch movies and also participate in theatre or television productions. She has worked as a stage manager for most productions such as Dom C’s by Nyansapo, Wise up and unshelved directed by Alfred Elikem Kunutsu. She has also worked as technical Director for the plays Nasoebi and Odasani. She worked again as a crew in Spirited Actor, by Tracy Moore, Alien King sound Crew,Leopard’s Choice Production Assistant. She co-directed The trial of Dedan Kimithi and directed ‘PITY THE FOOL’by D.M Larson, SELFLESS an improvise play for the Counseling and Placement Center of the University of Ghana and GRIP AM by OLA ROMITI. As a director and creative artist she believes her works should influence societal behaviors positively. Akweley does not seek to change society but rather create the avenue for change. “As a director I believe this country will only develop when we start to value the creative arts and technical education”, she stated. Previous articleFACE OFF; Blackup vrs Stonebwoy. Who is more romantic?